All papers are subject to double-blind peer reviews. The identity of the authors remains concealed from the reviewers, and vice versa. We feel that it performs at least as well as single-blind, and that it generates a better perception of fairness and equality in global scientific funding and publishing. Four main categories of contributed papers are published in Palaeovertebrata: Short Communications (not more than about 4-5 printed pages), Articles (between 6 and 29 printed pages), Monographs (more than 30 printed pages), and Book Reviews. Papers in languages other than English are not accepted, except for Monographs (English or French accepted). 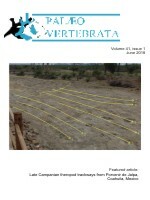 Submissions to Palaeovertebrata are now made on-line. Palaeovertebrata is completely open access: there are no charges to authors. Palaeovertebrata complies with the latest ICZN requirements for electronic publication of taxonomic nomenclature. Minimally the requirements for creating formal names includes coining a new Latin binomial, designating a holotype specimen that is deposited in a permanent, non-profit scientific research institution, illustrating the type specimen, providing a diagnosis of the new taxon that distinguishes it from others, and providing information about the type locality. Zoological names will be registered by the editors in ZooBank to obtain a Life Science Identifier (LSID). Each issue of Palaeovertebrata (including all of its articles) is archived on our server. A mirror image of the website and of its associated data is performed each day on a server to ensure the perenity of the archived data. - all your figures and tables. This is the single file that will be sent to the reviewers, so it should not contain information relative to your identity. Please also DO NOT include your cover letter inside this .PDF file. Also, for the sake of clarity, please put the figure and table captions along with the corresponding figures and tables in this document. if applicable, you may also include Word or PDF documents with Supplementary Online Material. Supplementary Online Material files should be compressed into one single .zip file. Regarding supplementary material consisting in a dataset of 3D files, we strongly advise you not to store them in the SI data .zip file, but rather to upload these data in our partner journal MorphoMuseuM. Your "3D dataset" will thus be published along with your publication in Palaeovertebrata. A PDF offprint of the online published article will be provided free of charge to the corresponding author. Manuscript authors should aim to communicate ideas and information clearly and concisely, in language suitable for the moderate specialist. Note : all text including tables, figure captions and literature cited should be double-spaced, with line and page numbers. To ensure double-blind peer review, the identity of the authors should remain concealed from the reviewers. Therefore, authors should only provide information about their identity in the title page section, which should remain separated from the rest of the manuscript. When constructing your merged .PDF document, please do not forget to remove the title page section. Corresponding author: Name, address, phone number, fax number, and e-mail address of the person who will handle correspondence at all stages of refereeing and publication, also post-publication. Only the email of the corresponding author is required. This must be on a separate page. It should be about 100-250 words long and should summarize the paper in a form that is intelligible in conjunction with the title. It should not include references. For higher-rank taxonomic units use Latin names. The abstract should be followed by three to five keywords additional to those in the title identifying the subject matter for retrieval systems. Keywords should not exceed 85 characters and spaces. The paper should be divided into sections under short headings. Except in systematic hierarchies, the hierarchy of headings should not exceed three. An example of systematic hierarchy can be downloaded here. All letters for primary headings are in caps (e.g., INTRODUCTION, RESULTS). Only the first letter of the secondary heading and proper nouns are in caps (e.g., Geological and stratigraphical settings.). Only the first letter of tertiary headings is capitalized (e.g., Lower molar description. ). All headings are boldfaced. Primary and secondary headings are centered. Tertiary headings are italicized, end in a period, and are the beginning of the first line of the paragraph. Authors should follow the practices set out in the International Code of Zoological Nomenclature (ICZN) (see Nomenclature Statement above). Cite the author of species on first mention. Collection numbers must be quoted, preceded by an institutional abbreviation. Use SI units, and the appropriate symbols (mm, not millimetre; µm, not micron., s, not sec; Myr for million years). Avoid elaborate tables of original or derived data, long lists of species, etc. ; if such data are absolutely essential, consider including them as appendices or as online-only supplementary material. Avoid footnotes, and keep cross references by page to an absolute minimum. We recommend the use of a tool such as Endnote or Mendeley for reference management and formatting. EndNote reference style for Palaeovertebrata can be downloaded here. Mendeley reference style for Palaeovertebrata can be downloaded here. In the text, give references in the following forms: "Sudre et al. (1989)", "Sudre (1974) said", "Sudre (1974: 28)" where it is desired to refer to a specific page, and "(Sudre, 1983)" where giving reference simply as authority for a statement. Note that names of joint authors are connected by '&' in the text. The list of references must include all publications cited in the text and only these. Prior to submission, make certain that all references in the text agree with those in the references section, and that spelling is consistent throughout. In the list of references, titles of periodicals must be given in full, not abbreviated. For books, give the title, place of publication, name of publisher (if after 1930), and indication of edition if not the first. In papers with half-tones, plate or figure citations are required only if they fall outside the pagination of the reference cited. References should conform as exactly as possible to one of these four styles, according to the type of publication cited. When applicable, please include the DOI link associated to a given publication. McKenna, M. C., Bell, S. K., 1997. Classification of Mammals above the species level. Columbia University Press, New York. Shoshani, J., West, R. M., Court, N., Savage, R. J. G., Harris, J. M., 1996. The earliest proboscideans: general plan, taxonomy and palaeoecology. In: Shoshani, J., Tassy, P. (Eds. ), The Proboscidea: Evolution and Palaeoecology of Elephants and Relatives. Oxford Unioversity Press, Oxford, pp. 57-75. Seiffert, E. R., 2003. A phylogenetic analysis of living and extinct afrotherian placentals. PhD, Duke University. Other citations such as papers 'in press' [i.e. formally accepted for publication] may appear on the list but not papers 'submitted' or 'in preparation'. These should be cited as 'unpubl. data' in the text with the names and initials of all collaborators. A personal communication may be cited in the text but not in the reference list. Please give all surnames and initials for unpublished data or personal communication citations given in the text. Keep these as simple as possible, with few horizontal and, preferably, no vertical rules. When assembling complex tables and data matrices, bear the dimensions of the printed page (250 x 184.6 mm) in mind; reducing typesize to accommodate a multiplicity of columns will affect legibility. Each table should be uploaded as a separate file. These normally include photographs, drawings, and diagrams in either black and white or color (free of charge). Use one consecutive set of Arabic numbers for all illustrations (do not separate 'Plates' and 'Text-figures' - treat all as 'Figures'). Figures should be numbered in the order in which they are cited in the text. Use upper case letters for subdivisions (e.g. Figure 1A-D) of figures; all other lettering should be lower case. All lettering should be in Arial font. All figures should be at a resolution of 300 dpi. The labelling and any line drawings in a composite figure should be added in vector format. Figures should not be embedded in the manuscript file; each figure should be uploaded as a separate file. Authors wishing to use illustrations already published must obtain written permission from the copyright holder before submitting the manuscript. Grouping and mounting: when grouping photographs, aim to make the dimensions of the group (including guttering of 2 mm between each picture) as close as possible to the page dimensions of 184.6 x 250 mm (for a two-column figure) or 88.3 x 250 (for a one-column figure), thereby optimizing use of the available space. Remember that grouping photographs of varied contrast can result in poor reproduction. We recommand that the cover letter includes an explanation of why the manuscript is of interest to Palaeovertebrata journal and what is novel about it. Furthermore, you are invited to provide a list of suggested reviewers. In addition, you may also provide a list of non-suggested reviewers.